Believe it or not, I’m a millennial. I know, you’ve read a ton of blogs and marketing seminars about how you’re marketing to Millennials wrong, and you need to change your tactics. I agree with most of those blogs. The dlvr.it team has written about successfully marketing to Millennials previously. However, as a millennial consumer, I have a different perspective. I’m one of those people that you are trying to reach with your marketing pitches. I am one of those individuals who is seeking to leverage their buying power to get the best deal. I’m one of those people who grew up on the web and with computers in every room. I’m also a consumer burdened by the curse of the millennials. Credit Sesame indicates that the average millennial owes $21,000 in student loan debt. Because of this, Millennials are extremely conscious consumers, only spending money on what they see as necessary. 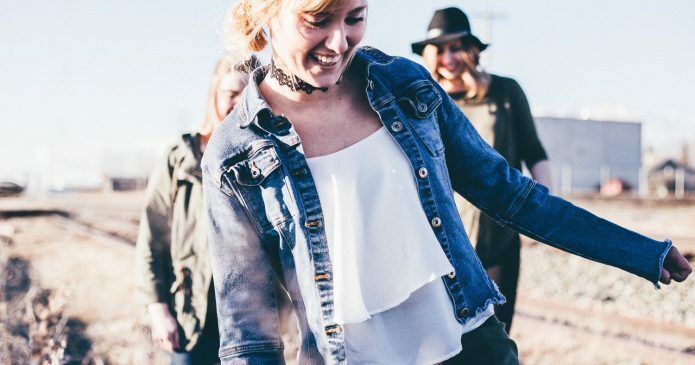 We’re going to explore some trends and incorrect misconceptions of millennials to reveal why you’re marketing to Millennials wrong. Why does this demographic matter? First, we need to define what millennial means. This is an extraordinarily difficult task because, to be honest, millennials don’t exist. I’m not saying that I don’t exist, or my friends don’t exist, but millennial is specifically a marketing term that was used to define a demographic that was desired by marketing analysts. Adam Conover presented some interesting insights at a marketing conference. First, the census bureau doesn’t define generations. Simply, generational differences are not actually all that big. Millennials actually can have children who are also millennials. This means that a gigantic proportion of the population is made up of millennials. Translate this into marketing: Millennials are the ones buying stuff right now. They are the people currently having kids and are the people who are going to stores buying stuff for their kids. Millennials are the ones ordering stuff online for their kids. To put it simply, millennials are the primary consumers right now. Second: Millennials are the first generation to grow up ‘plugged in’, if you will. I recall getting a computer when I was at the ripe age of six. As the first kid on my block with the internet, I was fortunate enough to grow up with access to information at my fingertips. Translate that into marketing: Millennials know how to leverage technology to their advantage. In essence, your consumer can know everything there is to know about your product and target market within minutes. Millennials know the deepest corners of the internet and are not afraid to use them to their benefit. So, why are we marketing to millennials wrong? Believe it or not, we think about millennials in a very imperfect manner. Millennials are not only the generation of technology but are afflicted by the future generational curse that affects all ages. All generations carry the burden of the crotchety old man statements that are indicative of the reason why we are marketing to millennials wrong. The previous generation thinks that millennials are narcissistic, selfish, and lazy. Therein lies the problem with marketing to this generation. It is important to think about millennials in terms of being adults. Millennials are coming out of college burdened with debt and the lowest wage growth in the history of the US. 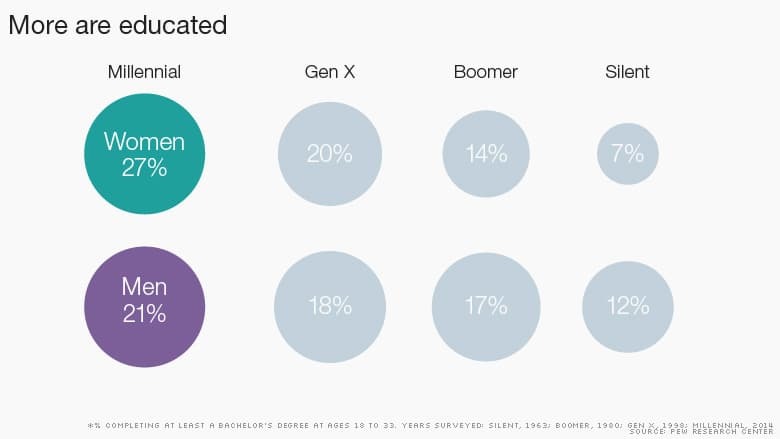 Not only are millennials the most educated generation in history (over 10% more millennials have college degrees than their GenX counterparts), but they are also the most financially encumbered generation. Millennials have to worry about paying off student loans with wages that do not match their level of education. Many of our generational peers are coming out of colleges, planning on entering low-wage jobs as public servants or teachers. How does the media see millennials? Even though millennials are educated, idealistic and innovative, the generation is painted in the media as the ‘selfie stick’ generation. Time magazine published a photo on its cover of what it believed Millennials looked like. 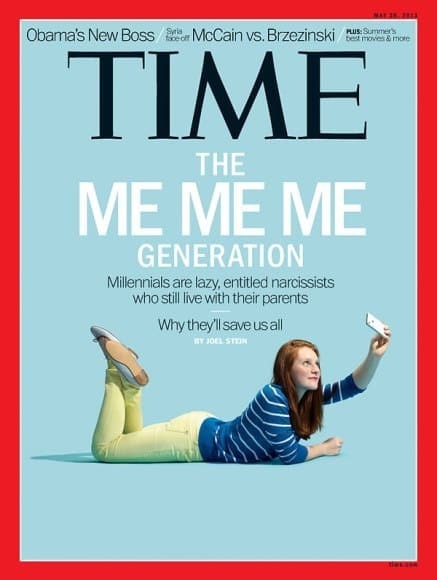 The millennial is taking a selfie surrounded by captions like “The Me, Me, Me Generation”. This is the stigma that millennials have to work to overcome. Of course, we live with our parents. We have experienced the slowest wage growth in any generation. Our education necessitates frugality with our money. We have to be careful about purchases, as most of our money goes to rent, utilities and transportation. Here is where marketing comes in. Remember your demographic. Entitlement doesn’t typically enter our vocabulary. We are smart, educated, and innovative. Bear in mind that we are setting out in life to make our own lives better and the lives of others better. We care about things like climate change, women’s rights, and wealth distribution. These are what we care about. Alienate us, and we will probably not like your brand. Marketing is now NOT about selling a product, but about selling a vision. Millennials care about how your product or service is going to make their lives easier or will make the world a better place. Because we are such frugal consumers, we do not tend to give the benefit of the doubt. We build loyalty to our favorite brands and stay with them for years, as long as they are good to us. If they aren’t, we won’t waste our money anymore, and we’ll move on, quickly. How are others implementing branding strategies with this in mind? One of the excellent brands that has built a seriously loyal following is Apple. Yes, they make great products, but they also have figured out how to market them to those who can make use of them. As the technology generation, millennials care about their tech and how easy and secure it is. In fact, Apple has created products that are very user-friendly and extraordinarily secure. These characteristics matter to the tech generation. The man behind this company’s success is widely regarded as one of the world’s foremost marketing geniuses, as he found a way to both make a great product and market it in a way that communicated his vision. Steve Jobs cornered the market on genius in the technological world, as he found ways to leverage existing technology and make it work for the most recent generation. He made the product appeal to the millennial generation and helped them to understand its meaning. I have never accused him of marketing to millennials wrong, even though his company was created during an entirely different generation. How can we apply these lessons? Consider that you may already be using these lessons. 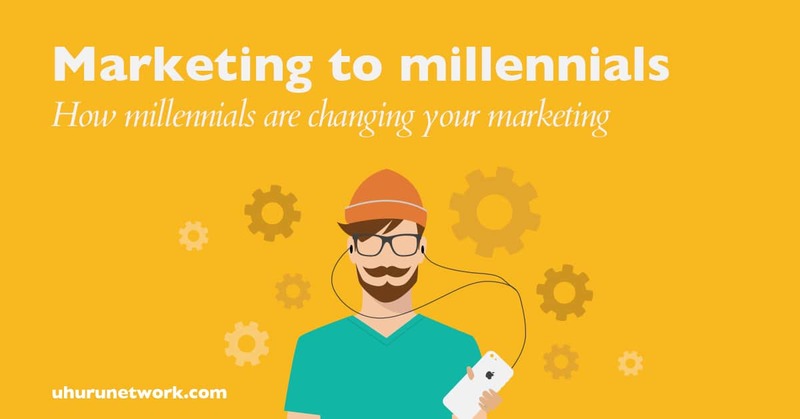 You might already be marketing to Millennials correctly. Many companies, however, consider marketing to millennials wrong to be a small price to pay. Applying these lessons means understanding the place that your consumers are in. Consider how your product will make their life better. Examine the lessons of Steve Jobs, who made products better for his consumers. Think about Bill Gates, who makes the world better with the products that his company makes. Remember that Millennials don’t necessarily care about the selfish motivation of new products, but rather, how these products benefit everyone in the long-term. Consider how many viral marketing campaigns haven’t been about how a person would benefit, but more so about how the world would benefit. All of these traits are quintessential to the mind of the millennial and what they care about. Remember these characteristics when creating your marketing plan. Go forth and make the world a better place for the millennial. Check out some of our other articles about how to effectively write for your blog and also how to market on a budget.